Millions of files in the Football Leaks dataset relate to the business of a Kazakh-Turkish family called the Arifs. 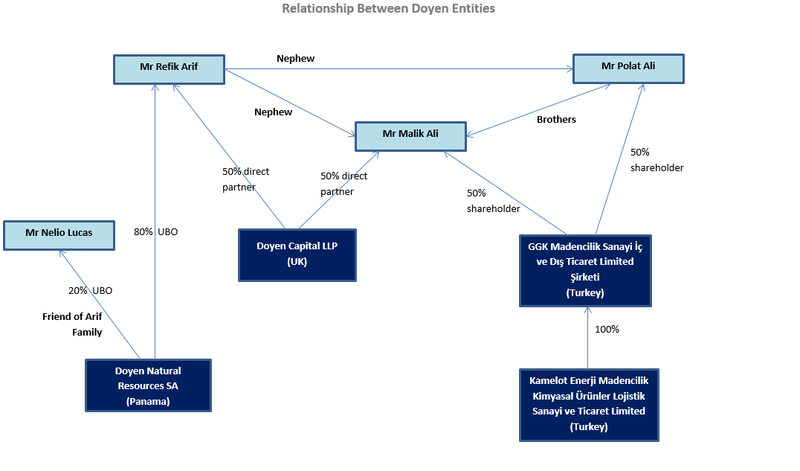 The particles of what is now known as the ‘Doyen Group’ were for nearly two decades an assortment of companies “linked by common ownership interests by the Arif family and their close business associates”. Between them, the Arifs own, openly or in secret, businesses in London, Lisbon, and New York, as well as a galaxy of “offshore entities (including in the British Virgin Islands, Cyprus and Panama)”. But it is Turkey, where the family has “invested $15bn”, according to Tevfik's Savarona testimony, and which acts as the nexus for the companies' operations. With such sums at stake, it is unsurprising that Tevfik distanced himself - and his poor reputation - from the launch of the 'Doyen Group' brand in 2011. Instead, younger brother Refik began taking his place on the paperwork, often alongside his nephews, Arif Arif, Polat Ali and Malik Ali. Of course, not much changed practically. The source of the funds remained the ever-flowing money-fountain from the Kazakh metals business, diverted through the family's Ravana Family Foundation in Curacao. And the brothers still ran the show. “The head of the family is my uncle Roustam Arif [sic],” Arif Arif writes in 2013. “In our culture, the patriarch is usually the oldest member of the family. Roustam is my father’s oldest brother. Even though my father is a successful entrepreneur in his own right (hotels, construction and real estate), his younger brother Refik Arif is the principal figure in the main family business (commodities),” he adds. The most public aspect of the new enterprise is the London-based sports investment and management firm, Doyen Sports, opened with a 19 million USD loan from Refik. It was to be the younger Arif’s first shot at running a family business. Doyen Sports quickly began to acquire a roster of sports personalities like David Beckham, Usain Bolt and Boris Becker. But its principal interest was football and Third-Party-Ownership (TPO) of players, including Barcelona superstars, Neymar and Xavi Hernandez, and Monaco's Radamel Falcao. If the young Arif brought the money, it was Doyen Sports's new CEO, Nelio Lucas, who provided the credability. Lucas is a Portuguese businessman who started his own football operation from the beginning of the 2000s, while still in his early twenties. He is said to have learned his craft from working for Israeli super-agent, Pini Zahavi. But the old family ways were hard to shake off. EIC's investigation reveals that the Arifs' sports operation used offshore slush funds to pay millions in suspicious 'commissions', and Nelio and Arif tried to bribe the Real Madrid president into purchaing one of their players, using booze and prostitutes at the Arif family mansion in Miami. It was all part of a jet-set lifestyle of girls, parties and keeping a clenched fist on their cash. Despite being a resident in London and running a multi-million-pound investment firm, Arif Arif officially only received a paltry 1,000 GBP monthly salary from Doyen. He also lived rent-free in Refik’s 20 million GBP property located at Carlyle Square in the exclusive Chelsea area of west London. Bought by Refik in 2009, the family went to great lengths to hide the ownership and avoid UK taxes. Emails in the Football leaks trove show that in 2014 Refik and Doyen arrange to transfer the mansion's owership from a BVI company to something called the “Carlyle Trust” in Guernsey. Correspondence reveals that the shift was designed to save millions in inheritance taxes “in case Refik dies”, but also circumvent newly enacted HMRC tax rules on UK properties nestled in offshore companies. Specifically, the UK Annual Tax on Enveloped Dwellings (ATED), capital gains and the ten-year anniversary tax. Over ten years, thid could have deprived the UK treasury of millions in revenue. Doyen's main operations in Turkey run through two organisations, GGK Ỉҫ Ve Dis Ticaret Limited Sirketi and TGG Construction. TGG Construction is a property development company set up in 2011 and located northeast of the Şişli district in Istanbul. It forms part of the co-dependent construction network of Sembol and Rixos, and lists many of the group’s prestigious contracts on its website. 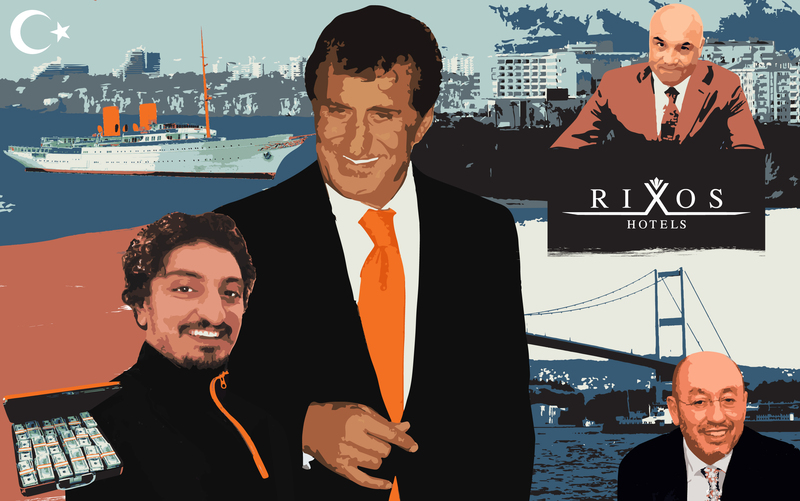 Guney Ikiz, former vice-chairman of Sembol and Rixos and manager of the companies’ Libya operations, was selected to run TGG, and the company's emails provide an insight into the group's blasé attitude towards paying bribes. No one in Doyen appeared to object to the payment of this “bribe”. A few kilometres west of the TGG offices, near Taksim Square, is GGK – “Gubre Gida Kimya”, known as Fertilizer Food Chemistry in English. GGK was established to invest in fertilizer products, mainly in Iran – but quickly emerged as a conduit for Doyen sectors, including coal, oil and uranium, such as the office which manages the family's 6.5 per cent share in Anatolia Energy - and the Temrezli Uranium Project - through the BVI company, Blenham Ventures. In 2012, Doyen hired a London-based, former Barclays Capital banker called Timucin Kaan as head of GGK. Kaan agreed to take the position for a 240,000 GBP salary and 180,000 GBP sign-up fee, but only if Doyen agreed to alter the tems of his contract to ensure he paid less in taxes. Timucin Kaan did not respond to The Black Sea’s questions about his tax affairs. A forty-six million dollar "gift"
After Kaan’s arrival, GGK purchased energy group Kamelot Enerji for 12.1 million USD, using a substantial cash input from Refik through his holding company Castello Ltd and the family’s Ravana Foundation. Kamelot intended to import thousands of tonnes of Russian and American coal for sale on the Turkish market. Rather than purchasing the coal directly, however, the Arifs used their Panama company, Doyen Natural Resources (DNR), as a conduit for the transaction. Documents show that DNR bought the coal for around 180 USD per tonne, and then traded to Kamelot for ten USD more. It’s not clear for how much Doyen then sold the shipments, but Kamelot’s financial records for 2014 and 2015 show only millions in losses - and they never paid any taxes in Turkey. Yet Kamelot continued to buy and sell coal, sending millions to DNR each month. DNR's Credit Suisse statements show millions being paid into the family’s trusts, including the one in Guernsey which owns the London mansion. "We need to liquidate the company ASAP"
In 2012, the Arifs had invested alongside the Kazakh trio from ENRC (led by Alexander Maskkevitch) in Zamin Ferrous, a mining company owned by Indian businessman Pramod Agarwal with iron ore contracts in Brazil. In 2015, the group became embroiled in a long-running legal disputes over money, including sums owed to Doyen for its initial 50 million-dollar investment. Therefore in the summer of 2014, Doyen needed to liquidate DNR. They were concerned about Panama’s poor reputation with western banks, and a potential UK tax liability. The iron and coal business would be moved into a new Panama company called Prime Natural Resources. But before that can happen, Doyen mist find a way to disappear over four million dollars it owes to DNR for the coal, without raising suspicions of fraud with the liquidator in Panama. If Kamelot kept the cash, it would "in all likelihood be liable for Turkish tax," says Amro Sinjab, Business Development Associate at Doyen Capital in London. As other deals show, taxes are only minimally tolerated by the Arifs. Doyen Chief Financial Officer, Nitesh Shah, suggests moving the cash to the Arifs’ Guernsey-based company, Eristavi, owned by Arif Arif's Lomisa Trust. Shah writes to Rupert Worsdale, a tax expert with Luxemburg advisory and investment firm, Maitland Group, who assisted Doyen and GGK during the original purchase of Kamelot. In September 2014, DNR begins gifting money to Lomisa – which disappears into the Doyen black hole of cash. Kamelot continued to trade with a new Panama company, Prime Natural Resources. But it was not the only cash to make its way from DNR to Lomisa. 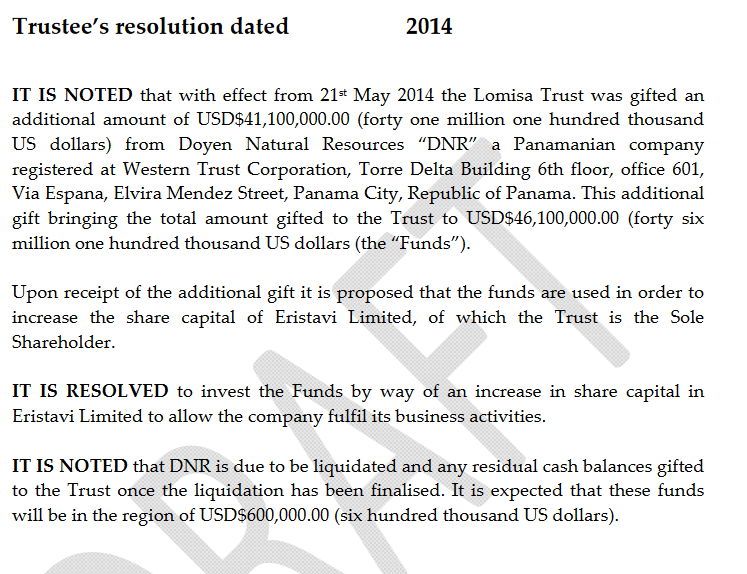 A letter dated month earlier shows DNR “gifted an additional amount of USD $41,100,000.00 (forty one million one hundred thousand US dollars) to Lomisa Trust. This brings "the total amount gifted to the Trust to $46.1m”. Like DNR's coal revenues, these millions went to increasing Eristavi's share capital in low-tax Guernsey. Another reason to flee from the Doyan name might have had something to do with a troublesome Bloomberg article published a year earlier. On 2 July, 2013, Bloomberg reporter, Alex Duff, published a piece about the “Kazakh Family” backers of Doyen Sport's questionable football operation. Although the substance of the story was relatively innocuous, it seems that mention of the Arif family, the Savarona yacht and Kazakh connections, was enough to force the family into a frenzy. The story was apparently enough to persuade the Arifs to close the UK business and recolate to a tax-friendlier Dubai under the name Doyen Meten. At least on paper. Journalists recently visiting Doyen’s London office witnessed a fully staffed operation, with the company plaque still on the door. The day after the story was published, Arif Arif complained to Rod Christie-Miller, Chief Executive & Partner at Schillings, a London law firm specialising in defamation and privacy. In the months and years after the Savarona affair, the Arifs employed the servcies of the British privacy law firm, Schillings, and Bell Pottinger, the London PR company famous for scrubbling online criticism of despotic regimes, to remove news stories linking the family to the yacht scandal. “We don't like fame Rod, and [the journalist] does mention the yacht incident…” Arif Arif wrote. Internal communications give a glimpse into why the Arifs’ are so publicity averse: their relationship with Mashkevich and his “friends”. “BUT, “Ayla responded. “On the otherhand, he also is helping dad keep hold of his primary business”. When the Bloomberg piece was then picked up by Tukish media, Arif complained again, this time to Nelio Lucas. “They are bringing up the yacht, the relationship to the PM [Erdoğan], everything,” Arif wrote. “Doyen brand is dead bro. I have to distance myself and the trading from it…” he added. “Lawyers told [me] ‘now that your father has been identified as a key backer, the [Doyen] name is infected'” he added. When Nelio reassured Arif that the Bloomberg piece was “not that bad”, the heir-apparent scolded his friend, reminding him that he had always lived in the civilised world, and could not understand the power of the Kazakhs to interfere with the family’s money machine. “[You] must explain to me,” Nelio answers. The “high-level” Turkish relationships the Arifs were desperate to protect include several businessmen close to the President. The Black Sea by crji.org is licensed under a Creative Commons Attribution-ShareAlike 3.0 Unported License if not otherwise stated. Based on a work at theblacksea.eu. This web application is Free Software (AGPLv3+), the source code is available on GitHub and waiting for contributions.